For anyone that doesn’t get the Spanish translation, it’s “Party in Your Mouth” Enchiladas and they are exactly that. These easy to prepare, rolls of flavor are so tasty you will want seconds…and thirds…and maybe even fourths. Shhh, I won’t tell anyone. When I brought leftovers to work, I practically had to beat my co-workers away with a stick after they tried a bite. I like to start off this meal with a Chilled Avocado Soup (in the summertime) and serve with Spanish rice. If you like an extra bit of heat with your meal, this Hot Habanero Relish is an amazing accompaniment! In a medium pan, heat olive oil on low. Add onions, garlic and saute until soft, about 2-3 minutes. Add green chiles, beans, chicken stock and cumin. Mix well and cover. Simmer on low 15 minutes. Remove cover, add chicken and cook an additional 5 minutes, or until it thickens and liquid boils down. Set aside. In a large nonstick pan, melt butter over medium heat. Add onion and cook, stirring occasionally, until the onion softens and starts to turn translucent, about 3-4 minutes. Add flour and stir well. Cook for 1 minute, stirring constantly. Slowly whisk in the chicken broth, until it becomes smooth. Cook over medium heat until the sauce boils and thickens, about 4-5 minutes. Add green chiles, jalapeños, and salt to taste. Cook another minute then remove from the heat. Stir in the Greek yogurt. 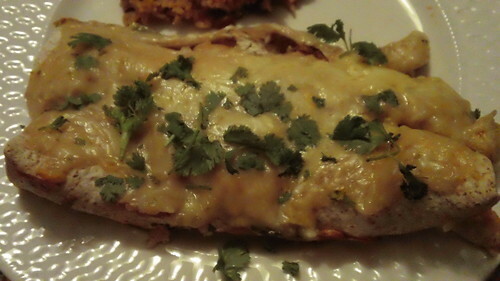 Spread about 1/4 cup of the enchilada sauce on the bottom of a 9×13″ baking dish. Fill each tortilla with 1/3 cup of the chicken/white bean filling. Roll the tortillas and place seam side down in the prepared baking dish. Continue filling remainder of the tortillas. Pour the enchilada sauce over the top of the enchiladas. Top with cheese. Cover with aluminum and bake 20-30 minutes, until the enchiladas are hot and the cheese is melted. Remove from oven and top with LOTS of fresh cilantro…and the Habanero Relish, if you please. Chunky Aztec Chocolate Granola – What Smells So Good? I LOVE chicken and white beans together! Got to try this! Really good! I love this recipe, am adding it to my board now! Happy sunday! I love the white beans with this recipe – sounds delish! Thank you, you must try it. Delicious! Enchiladas = one of my favorite mexican foods! Mine too. They are addictive! These enchiladas look so good! Talking about all this Mexican food I had such a craving for enchiladas and had to make them. This looks like such a great recipe too!! Thank you! I’m craving them now too! Chicken and white beans are the perfect combination! These sound great! I don’t blame your co-workers! I think I can actually smell this. Muy bueno! I’ve had enchiladas on my to-make list for awhile. Another one for my list! Awesome! Let me know how they come out! Love enchiladas! Party in my mouth enchiladas sounds right up my alley. Oh I love enchiladas. I think your title fits perfectly, these are a party in your mouth! I always like the addition of beans in things like enchiladas…not only are they frugal, but so healthy for you too. Great job! Thank you! My husband is obsessed with fiber, so he loves the beans, too! This is divine. I feel like such a slouch for making something so easy. Great Sunday Supper meal. These sound awesome! I cannot wait to try these! Yes on the whole menu…that would make me a very happy camper! These sound delicious. That’s quite a compliment. Thank you! I make enchiladas most of the time, but have taken a break recently because it causes so much chaos. It’s never enough for them. Do you have this kind of excitement in your house over enchiladas? Your dish looks great, so I can imagine they clamor for this dish! Umm, yes. My husband and I single-handidly (well, double, technically) eat over half of it at the first serving. So, you might want to make two batches if you have an xtra hungry household! These look cheesy and delicious! I love the addition of white beans. I love this lighter recipe! I haven’t made enchiladas in a long time. I can’t really say that the reason is. Thanks for the idea and your enchilada looks fantastic!